The Site Renderer handles the rendering of sites, assembling a common site decoration template (also called a skin) with a collection of documents. 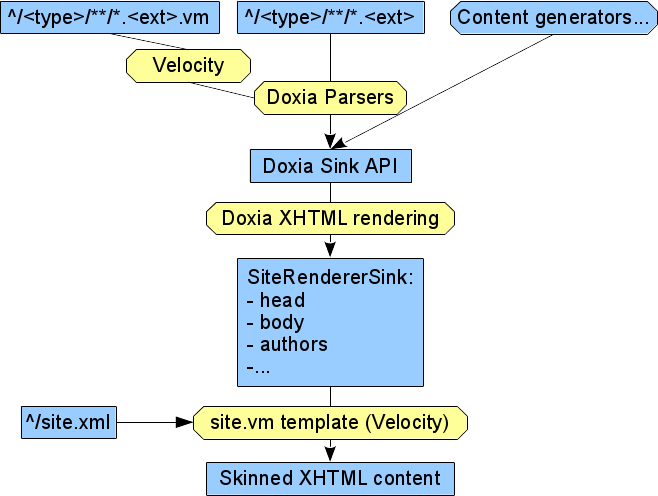 Documents can be dynamically generated with Doxia Sink API, like Maven reports, or simply read from static files written in markup supported by Doxia Parsers, eventually processed by Velocity if their file names end in .vm. A default site decoration template is included (see default-site.vm), but other decoration templates can be used at will, either as a standalone template or packaged in a skin artifact. Some documentation is available on how to create a new skin. Site decoration and documents with file names ending in .vm are processed by Velocity. alignedFileName String The file name of the (HTML) document being rendered, relative to the document being rendered. decoration DecorationModel This is a model that represents the data in your site.xml. currentDate Date Deprecated: use date or date.systemDate. The date when the site is rendered. currentFileName String The file name of the (HTML) document being rendered, relative to the site root. dateFormat DateFormat Deprecated: use date, date.format, or decoration.publishDate.format. An instance of the date format as defined in site.xml/publishDate/@format (default: An instance of the default date format for the locale of the document being rendered. dateRevision String Deprecated: same as currentDate. The date when the site is rendered, in the format "yyyyMMdd". doxiaSiteRendererVersion String The version of the Doxia Site Renderer in use. locale Locale The locale for the document being rendered. publishDate Date An optional hardcoded publish date that has been set programmatically. relativePath String The path to the site root from the document being rendered. supportedLocales List<Locale> The list of locales that the site will contain. i18n I18N Deprecated: use text. alternator AlternatorTool For creating alternators to easily alternate over a set of values. class ClassTool For simplifying reflective lookup of information about classes and their fields, methods and constructors. context ContextTool For convenient access to context data and metadata. convert ConversionTool For converting String values to richer object Types. date ComparisonDateTool For manipulating, formatting, and comparing dates. display DisplayTool For controlling display of references (e.g., truncating values, "pretty printing" lists, and displaying alternates when a reference is null). field FieldTool For (easy) access to static fields in a class, such as string constants. link LinkTool For creating and manipulating URIs and URLs. The API for this tool is designed to closely resemble that of the VelocityView tool of the same name. loop LoopTool A convenience tool to use with #foreach loops. It wraps a list with a custom iterator to provide greater control, allowing loops to end early, skip ahead and more. math MathTool For performing math functions. number NumberTool For formatting and converting numbers. render RenderTool To evaluate and render arbitrary strings of VTL, including recursive rendering. text ResourceTool For simplified access to resource bundles for internationalization or other dynamic content needs. sorter SortTool Used to sort collections (or arrays, iterators, etc) on any arbitary set of properties exposed by the objects contained within the collection. xml XmlTool For reading/navigating XML files. This uses dom4j under the covers and provides complete XPath support. If you intend to use custom Velocity tools, add them to the Maven Site Plugin's dependency list and make sure that they have a bundled configuration file in /META-INF/maven/site-tools.xml. See DefaultSiteRenderer.createToolManagedVelocityContext(...) source for more details and the tools usage summary. project MavenProject The current project. project properties String Properties defined in POM are directly available. See AbstractSiteRenderingMojo.createSiteRenderingContext(...) source for more details. authors List<String> A list of authors from the source document. bodyContent String HTML body content of the Doxia generated output. dateCreation String Deprecated: use documentDate. The date specified in the source document, in the format "yyyyMMdd". creationDate Date Deprecated: use documentDate. The date specified in the source document. documentDate String The date specified in the source document: semantics has to be chosen by document writer (document creation date, or document last modification date, or ...), and format is not enforced. headContent String HTML head content of the Doxia generated output. shortTitle String The title of the document, excluding the project or site name. title String The title of the document, including the project or site name. docRenderingContext RenderingContext (since 1.8) The document rendering context. See DefaultSiteRenderer.createSiteTemplateVelocityContext(...) source for more details.